Yamas and Niyamas are the 1st and 2nd limbs of yoga (Patanjali, Yoga Sutras) and are self regulation, living these in society and with oneself; which help to overcome the limiting and restrictive aspect of the mind and help us when observed to live our lives appropriately, from the higher mind and leads to Sattwa guna, purity, correctness. These cannot be forced, but we can be aware of the yamas and niyamas in our daily lives and with the yoga practices of Bihar School of Yoga, Satyananda Yoga® as well, the yamas and niyamas slowly start to manifest in us from within effortlessly. Ishwara Pranidhana - total, unconditional surrender to God, Cosmic Consciousness, Laws of the Universe (God's Will, 'Na ham karta, tu hi karta kevalam') Aligning ourselves with the Permanent, unchanging, and not Nashwara, temporary, changing, impermanent. Yamas and Niyamas continue throughout our lifetime and through all the 8 limbs of yoga and help us to keep advancing. 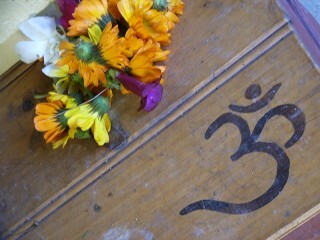 If you wish to know more about "Yamas & Niyamas" please go to yogamag.net. Search "Yamas & Niyamas part 1 and 2 by Swami Omananda." *"Asana is defined in Sage Patanjali’s Yoga Sutras as ‘that position which is comfortable and steady’. The raja yogis, then, practiced asanas to develop the ability to sit comfortably in one position for an extended period of time, as necessary for meditation. The hatha yogis, however, found that asanas open the energy channels and psychic centres. They became tools to attain higher awareness, enabling the exploration of the body, breath, mind and subtle states. Today, asanas are acknowledged to be techniques which place the physical body in positions that cultivate awareness, relaxation, concentration and meditation. An important part of this process is the development of good physical health by stretching, massaging and stimulating the pranic channels and internal organs. Scientific research has proved that asanas prevent disease, promote health and have curative abilities, therefore many professionals use them to manage psycho-somatic stresses and diseases. *"Asanas work on both the body and the mind. These are not separate entities although there is a tendency to think and act as though they are. The gross form of the mind is the body and the subtle form of the body is the mind. Practising asanas integrates and harmonises the two." The shatkarmas consist of six groups of purification practices which harmonise different aspects of the body and personality, inducing physical and mental purification and balance. *"Mudras can be described as psychic, emotional, devotional and aesthetic gestures or attitudes which link individual pranic force with universal or cosmic force. Bandhas aim to lock prana in particular areas of the body and redirect it for the purpose of spiritual awakening. The physiological and psychological effects of mudras and bandhas have been examined and systematised." *"Prana means ‘vital energy’ or ‘life force’, ayama means ‘to expand’, accordingly pranayama is expansion of the vital energy. This vital energy is responsible for all life experiences including physical and spiritual. Pranayamas harmonize the pranic body which is a network of nerve channels carrying the vital force to each and every cell and organ infusing them with life and dynamism. Pranayamas are also the preparatory practices for the awakening of the chakras (psychic centres) and aid in the perfection of kriya and kundalini yogas. In the past pranayamas were taught to a select few as a part of higher yoga practice, but in the course of time Sri Swami Satyananda Saraswati reintroduced the subject of pranayama as a part of daily yoga sadhana. The sequence in which the pranayamas are taught today by many yoga schools were developed by the Bihar School of Yoga." Pratyahara is the 5th limb of yoga (Patanjali). It is said that 'yoga' actually begins here. Prior to pratyahara it is preparation. Stilling the mind starts here at pratyahara. One begins to move inwards. There are many yoga techniques of pratyahara, such as shavasana, yoga nidra to name a few that have been developed by Satyananda Yoga® from ancient scriptures. Tensions can be removed so that relaxation can occur. Concentration techniques that comprise the 6th limb of yoga (Patanjali) that help the mind to focus and strengthen, to become one-pointed. This stage leads to Dhyana. Meditation or Dhyana is the 7th limb of yoga (Patanjali). In actual fact Dhyana means 'attention!'. All techniques of Pratyahara, Dharana and Dhyana have different levels and stages of practice as clarified by the Satyananda Yoga® or Bihar School of Yoga tradition, derived from the Upanishads, Tantra, Samkhya traditions which have also been classified, taught and published by Bihar School of Yoga publications, classes and courses.